Put all the ingredients into a pan and bring up to a boil. Lower the heat and simmer, turning the kabocha pieces from time to time, until the liquid has reduced to half - about 15 minutes. Leave to cool in the liquid - the kabocha will absorb flavor from it as it cools. Drain off lightly to pack into a bento box. This will keep in the refrigerator for 3-4 days. 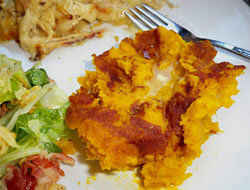 If you are making this from fresh uncooked squash, increase the water by 1/4 cup and simmer a bit longer. 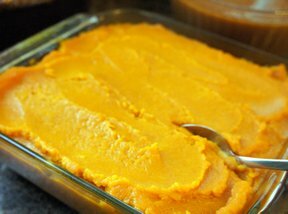 You can freeze the simmered squash itself, in single portions. Put 1 or 2 pieces each into cupcake liners, and freeze them lined up on a tray. Once frozen, the single portions can be packed into a freezer bag. Defrost the single portions in the microwave on the HIGH setting for a couple of minutes, and cool off before packing into a bento box.